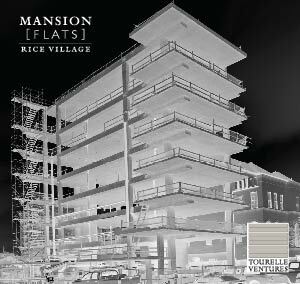 Design work done for Tourelle Ventures on their condominium project Morningside Mansions, located in the Rice Village. The studio was hired by Tourelle Ventures to design their logo and business card and create a website and brochure for their project, “Mansion Flats”, a seven story mid-rise condominium in Rice Village. 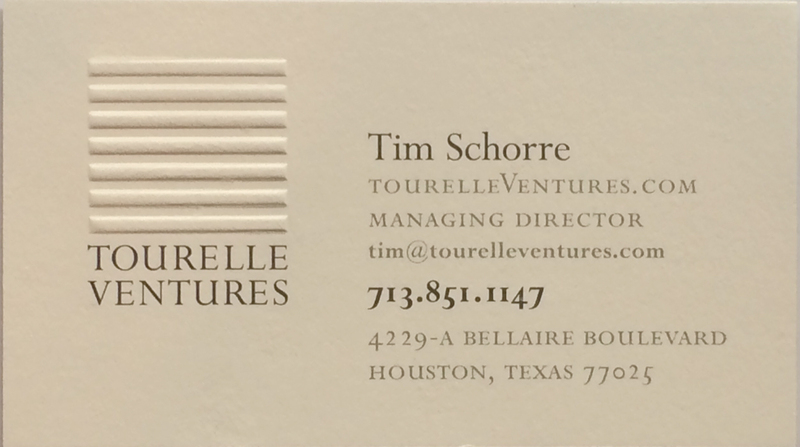 The logo design for Tourelle Ventures was inspired by the 7 floors of the condominium. A drop shadow was applied to the graphic to give it depth. The letters that make up the name and their relationship to each other were the starting point for the selection of a typeface. Perpetua, designed by Eric Gill. The font has capital letters with beautiful, classic lines and the clean, chiseled look recalls the type designer’s stonecutting work, which we thought carried the appropriate tone for the logo. One of the selling points for the condominiums was the uninterrupted view over the neighborhood of Southhampton and the Texas Medical Center. We hired Paul Hester to take a panoramic photo from the top of the building for the website and brochure. For the brochure, a negative image of the building in black and white was used on the cover to create a sculptural effect since at the time the building was in the early stages of construction. The color panoramic photograph was used on the inside and stretched across the four panels of the gatefold brochure, that opened to 37" x 9". Beneath the panoramic photo were 4 sample floor plans that illustrated some design options that ultimately were up to the owner. View the web version of the brochure. The business cards were printed in 2-color, black and PMS 404 on 120# duplex cover stock, with the front a natural white and the back sawgrass. The logo was blind embossed to give it dimension and a tactile quality. View a larger image of the printed card.